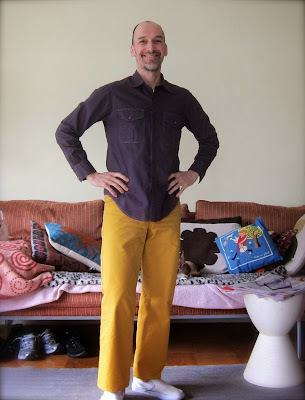 male pattern boldness: MPB Exclusive: Friday Fabric DYE-O-RAMA! 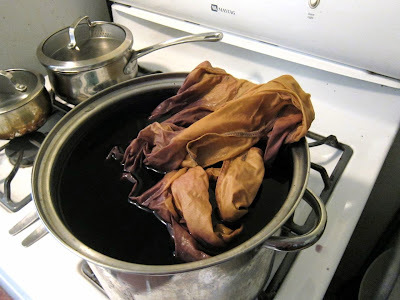 MPB Exclusive: Friday Fabric DYE-O-RAMA! The first day of spring and it's snowing -- what better time to experiment once more with my Jacquard Procion dyes? 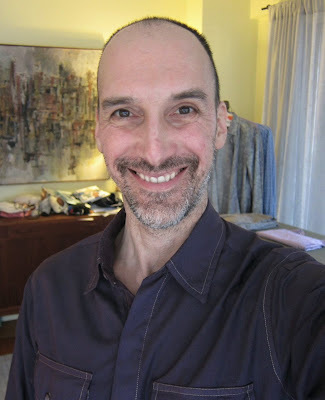 Today I dyed my blotchy tan shirt a mixture of fuchsia and black. I followed the same directions I did last time with similarly successful results. 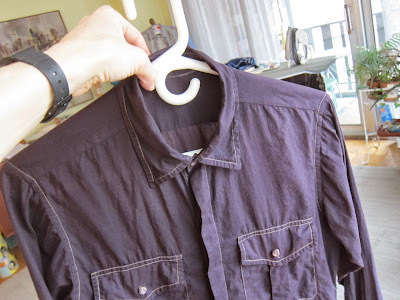 I soaked the shirt longer once I added my soda ash dye fixer this time, about an hour and a half total. Then I rinsed it in hot water and machine laundered with a mild detergent. 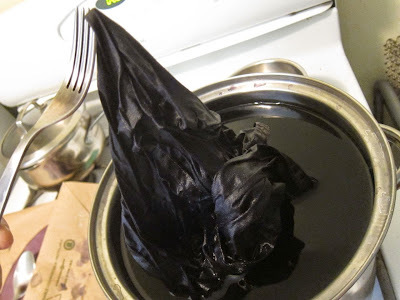 After laundering but still wet, it looked like this: no visible blotches. 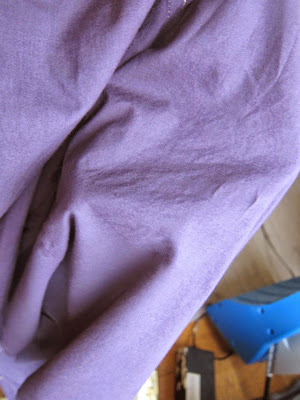 Whatever you call this color -- purple, aubergine? -- it's much more flattering. In other news, I found another sewing machine in the trash this week. Indeed, the foot pedal, which did seem to work at first, almost immediately lost contact with the machine (hence the sign on the box in the photo). The cheapest replacement I could find cost $25 on eBay. Readers, I returned the sewing machine to the trash where I'd found it. I probably would have bought the new pedal in the past but today, not so much, not for a plastic machine like this one. And that's it! I hope your first day of spring is a little less snowy than mine -- it's a blizzard out there. It looks like a completely different and more expensive shirt. The dye appears to have really saturated the fibers, so it's really even; the resultant contrasting stitching really brings out the construction details. What an improvement! I'm glad you gave it another go. The machine you sent back to the trash is a re-badged Janome and is actually a very nice, basic machine. 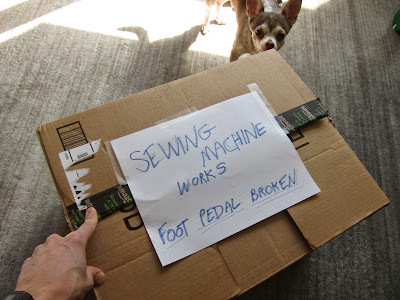 Pedals are usually easy to repair -- probably a loose contact. It would make a nice gift for someone looking for a first machine. Take the machine down to the local charity shop. If it goes to a tip it's an utter waste. Makes me enthusiastic. 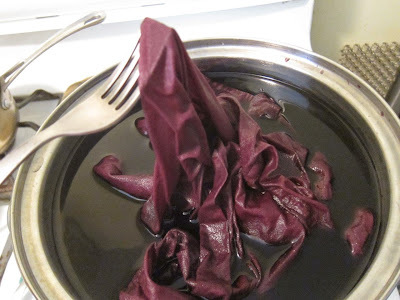 I've got several things to dye, and the procion dye, but just haven't had the time. 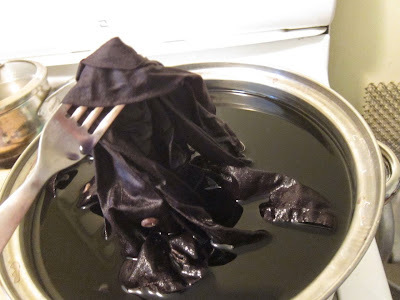 By the way, I hope that's a dye-only fork. The stuff is toxic, I think. 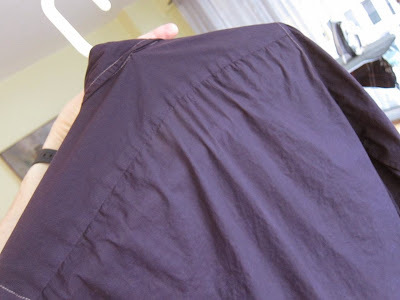 Oh, I like the dark plum color of the shirt! 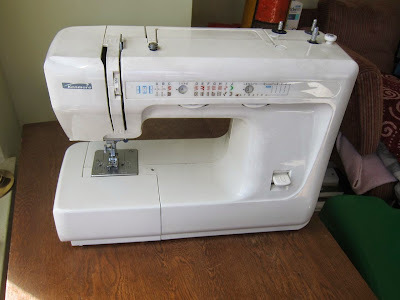 Anyway, my very first sewing machine is almost an exact match to the one you found. The machine is actually mechanical and sturdier than it looks, oddly enough. All of humanity thanks you for dying that shirt. Jewel tones do flatter you (mercilessly, I must say - are emerald, garnet, and royal blue far off?). suggest putting up an ad in the free section of craigslist for leading someone to the location of the machine, would be a shame for it to get ruined in the snow, someone could certainly use it! The shirt looks great now. The color looks great on you. And I love that the topstitching contrasts. Sharp! I do love a dark purple (eggplant baby!) with a mustard, and damn! Love the deep purple color. Your shirt looks awesome! I had to do a double take when I saw the picture of the machine you found. My mom bought me the same model for Christmas in 1998. 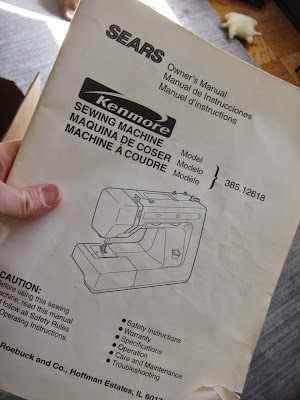 It's the only machine I've ever owned and I've sewed tons of stuff on it over the years. It's never given me any trouble and it's still working great. I used it yesterday for my "I'd rather sew and not go to work day"...haha! It was great and the machine ran great too. The only thing that's not that great is the buttonholer. I just go around the buttonhole 2 or 3 times and it looks sorta ok. Luckily I don't make buttonholes that often. NAME THAT PATTERN: DAYLIGHT SAVINGS EDITION! My UNDYEING Love for Rit Color Remover! Knickers for Men -- YEA or NAY? Fish Print Shirt -- The Dramatic Conclusion!